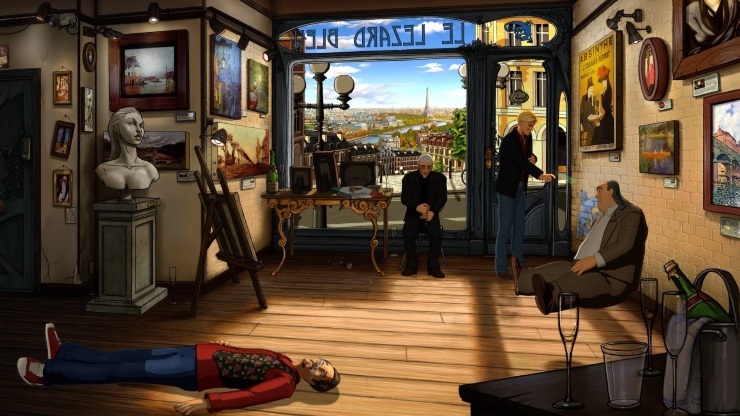 Nostalgia plays a huge part in Broken Sword 5: A Serpent’s Curse, from the old-fashioned point and click mechanic, to the 2D backgrounds, and even with the “boys’ own adventure” style of story telling. 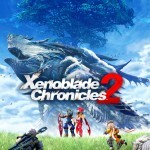 It’s clear that this was created with long-term fans of the series and genre in mind, and there is much here to engage them, with in-jokes and secrets to uncover. 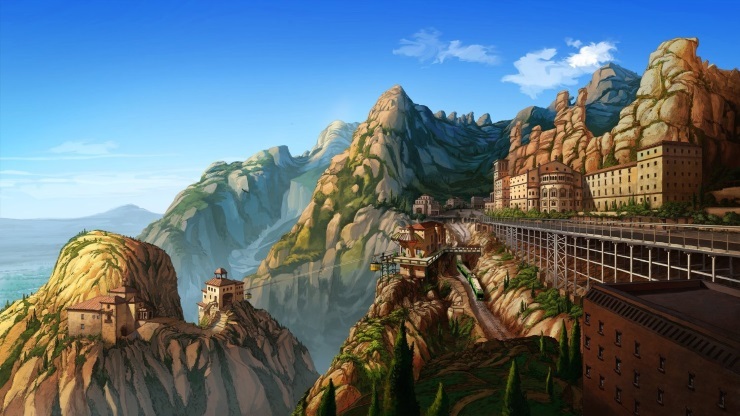 Broken Sword 5 opens with a sweeping vista across the Spanish Catalonian countryside. It’s 1932 we are told, and the fascists are drawing closer to a remote villa where a young family are the gatekeepers of an ancient secret. Central to this appears to be a painting and a medallion which is thrust upon the young boy as he escapes with his mother; his Father, and sadly the painting, are lost forever. Fast forward and our playable part of the story begins in modern day Paris. A murder and subsequent theft of the painting, “La Maledeccio”, starts our adventure which we soon find is focused on the conflict of ideals between Gnostic and Orthodox Christians. The core mystery is exciting and reasonably paced: “Evil is abound” we are told, and it is down to our heroes, George and Nico, to uncover the mystery of the painting, and why it is so significant. 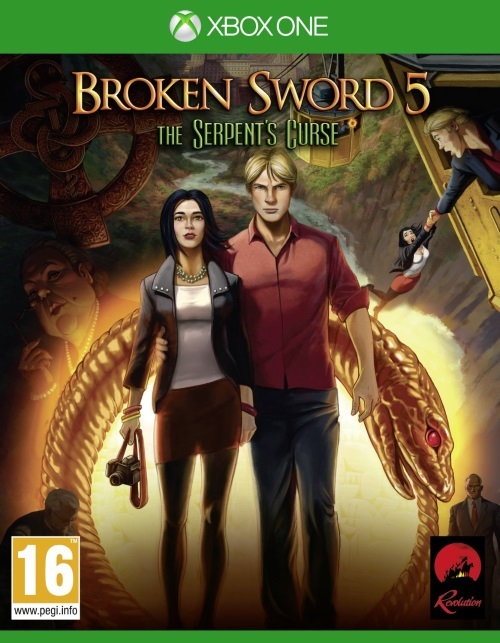 Broken Sword is a sedate affair, the mystery revealing itself slowly, and to some maybe too slowly. You progress through each stage, pointing and clicking at objects to examine them and sometimes pick them up. Occasional puzzles are placed in your way to solve. Solutions are, for the most part, pretty easy to come up with utilising a mixture of the environment and the items you pick up along the way. The inventory does become a little cluttered and at times you find yourself clicking on everything trying to find the right solution. The occasional puzzle will cause some head-scratching, but thankfully there is a hints menu to assist you, providing subtle clues to the solution gradually until the full answer is revealed in its entirety. There doesn’t seem to be a punishment for using the hints as many times as you like, but of course, by doing so much of Broken Sword’s enjoyment is diminished. A fail state is never achieved though; you simply cannot leave an area unless the problem is resolved, so you are never in danger of missing a vital clue and further piece of the puzzle to flesh out the tale. The art style is a lovely 2D affair, with gorgeous, vibrant, hand-painted backgrounds. Characters are 3D, pre-rendered and cell-shaded to provide depth to the surroundings. 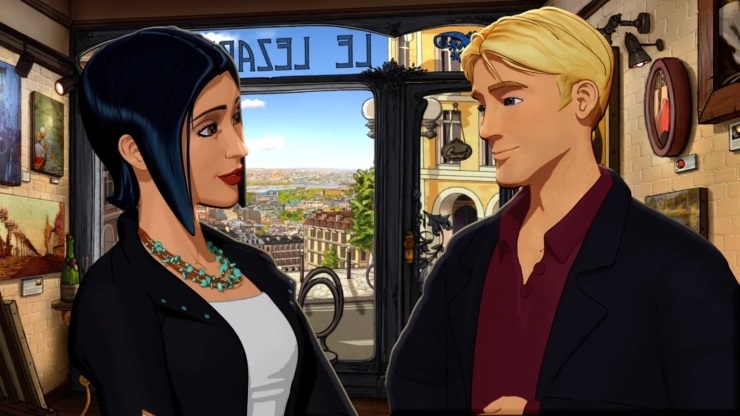 It’s very pretty to look at, but the character movements are a little stilted at times; indeed, Broken Sword is a stuttering affair, both with character movements and at times with awkward, unnatural dialogue. However, this is a world that feels lived-in, with genuine, likeable characters. The writing for the most part is excellent. 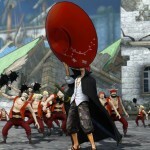 Characters have been lovingly crafted, and not just the ones that fans of the series will be familiar with. The attention to detail is fantastic with even the periphery characters serving to create a wonderful, lively adventure. Of particular note are the hapless Inspector Navet (who is clearly a long-lost cousin to Inspector Clouseau), the sardonic, Gallic revolutionary waiter full of disdain at serving the bourgeoisie their lattes and frappuccinos rather than the black gold his ancestors bled on the streets for, and the south London thug and sometime gardener, amusingly named Shears, whose existential philosophy on the human condition manifests itself through his topiary. It’s all wonderfully and wittily done. Broken Sword is a linear adventure with very little scope to explore outside the boundaries of the particular puzzles you are solving, however the inventory does make for some amusing dialogue trees. You can talk to almost everyone about pretty much everything in your pockets and they will usually have something clever to say. This adds a certain amount of dynamism to an otherwise straightforward experience. Broken Sword is split into two episodes and there is a definite shift in gear in the latter half of the game. Whereas the beginning was pretty slow-paced, moving around Paris slowly uncovering the mystery, the second half is much faster, with far fewer options to choose where to go next. The change of pace is welcome after a fairly lengthy first part, but it does highlight some of the story padding, and the ending feels a little rushed. 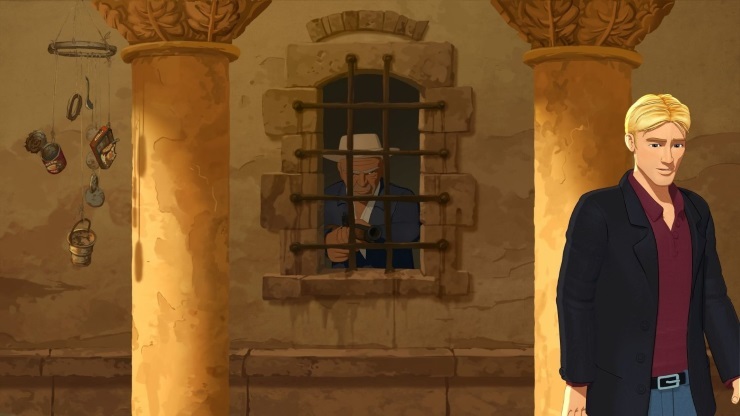 Nevertheless, Broken Sword 5: A Serpent’s Curse is a charming, well written adventure game. It has a compelling, intriguing tale to tell, great characters both old and new and some intricate, challenging puzzles to solve. 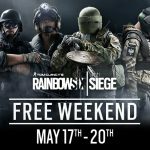 Experienced fans will find much to keep them entertained, and there’s plenty of story to keep new players engaged, too. There are some slight pacing issues, but they are minimal in a tale that has wit and charm to spare. Lovely nostalgic feel to it. Linear, particularly in the second half. A witty, sometimes challenging point and click adventure that will charm new players and delight existing fans.